It’s that same scene every time I leave Milan early in the morning. 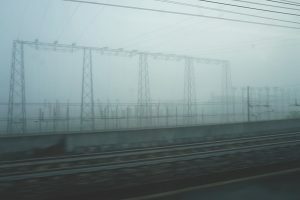 There are the train tracks stretching out their possibility with grass in between, and there are the tall apartment blocks squashed up against the tracks holding lives lived out against noise and grey and grime, all coated in fog today. We stop at Lambrate. I imagine Via Conterosso with its church at the end, all corners of a city that I’ve known and grown to love. We travel through thick fog to Pavia. There’s frost on the ground, and fields are marked out by ditches that claimed lives on dark, foggy nights. A lone pheasant stands on a ridge, a reminder that nature is still always there no matter how much we may ignore it. He is vulnerable, yet still he stands. We pass low-built houses and under graffiti-covered bridges, and pull into Pavia, with its 14th-century university, one of the oldest in the world. Its squares and porticoes may be shrouded in fog but it is still one of Italy’s jewels, a place of beauty, knowledge, learning and history. The conductor passes through the carriage and the girl sitting opposite looks into her book. A woman rides a solitary bicycle along the street. The morning itself feels solitary in the fog. It wraps us in its partially hidden sleepy world, and we too sleep with eyes open. This is the land of legends of pacts with devils in exchange for the souls of passers-by, and we this morning are passers-by. We go over a bridge, the River Ticino below, its grey waters indistinguishable from the grey of the fog. Two logs lie stagnant in the water. It’s an uneasy landscape, uneasy because of the uncertainty that lies behind what we cannot see. And then the sun comes out, and we move past ploughed fields and arrive at Voghera station. 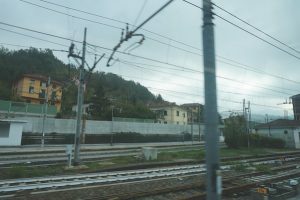 Our train is five minutes late, we’re told, as we go through Pontecurone and miles more fields with the occasional house and straight roads leading who knows where. We’re in Tortona now, yet the only Tortona I know is a design area in the south of Milan. And then it’s onwards towards hills and Liguria. 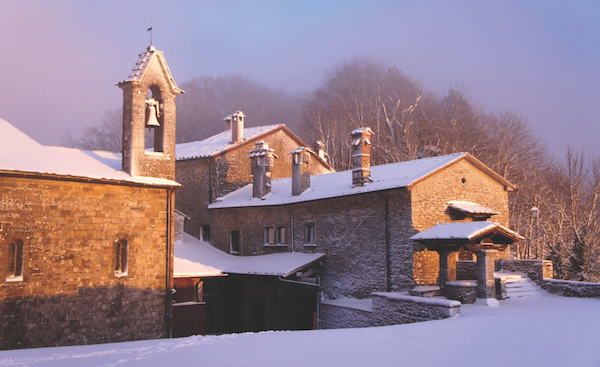 The beauty of Liguria lies not only in its sea, but also in its mountains, and as we come into Arquata Scrivia I’m reminded of this, along with the fact that the train is still running five minutes late. The fog has already started to lift to reveal woods where leaves are just starting to change after what had started to feel like the never-ending summer. We pass people’s gardens, look into their lives, and then off we go again through mountain tunnels and down to Genoa. The girl sitting opposite me is a student, as I’d guessed. She’s from Genoa but is in Milan at the university and will probably stay after she finishes. “There are more opportunities,” she tells me. We talk about the education system and how she’s changed her specialism to give her a better chance in the job market. It’s a common story, fuelled by worries of lack of opportunities and the increasing number of graduates who choose to go abroad. 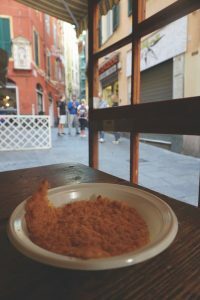 And then we’re in Genoa and we say our goodbyes and off I go to find my farinata, a typical Genoese speciality – a bit like a crèpe made of chickpea flour. “Legend has it that a bag of chickpea flour burst open on the ship,” the woman in Sciamadda tells me. “It formed the paste that’s then used to make the farinata.” Sciamadda literally means flame. It refers to the wood-fired oven that’s used to make both the farinata and various savoury pies, and it also refers to the place, the friggitoria, the latter being the fried-food shop where you can also buy fried fish, fried vegetables and fried polenta. I follow his advice, and go and sit outside at a wooden table in the narrow street, with houses rising up on either side of me. That’s how it is in Genoa, where space is short because of the mountains that reach right down to the sea. People built upwards in this city of contradictions also known as La Superba, and later built roads above it. Petrarch was the first to call it La Superba. 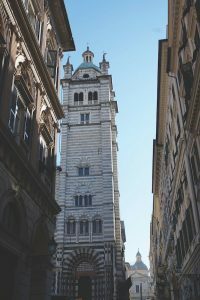 Genoa the Superb, the proud and magnificent, as it was known in the times of the powerful Italian maritime republics. The same Genoa that suffered great loss when one of the main bridges that carried people through the city collapsed in August 2018. The farinata, hot and fresh out of the oven, is crispy on top and soft below, another food memory to be stored and loved. The latte dolce is everything I could have expected and more, a mouthful of deliciousness that begs for just one more. It’s fast food, Genoese-style, under the blue skies of a sunny October day.